So. Pinewood Derby is stressful. Last year (after my hubby and I stayed up 'til the wee hours of the morning sanding and attaching weights and wheels) I decided we would just stick to the block of wood and make something fun out of it. You know, simplify the process a bunch. So I thought a Wii remote would be fitting...especially since Mr. C is such a gamer. And I thought it was a fairly original idea, but apparently not. 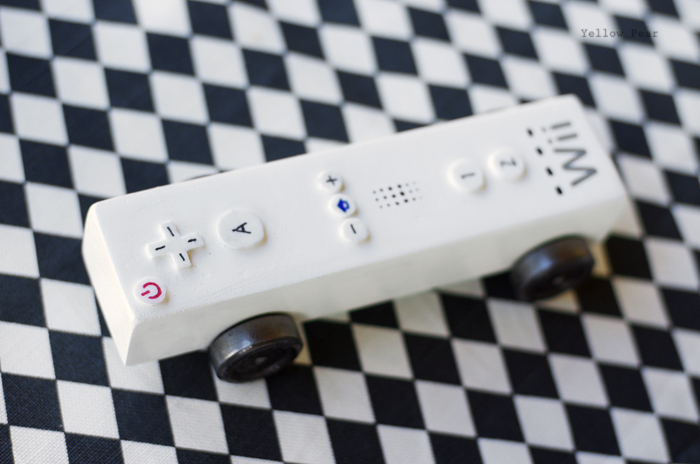 There are a ton of Wii cars on the web...and a lot of my friends have heard of so-and-so making one, but oh well. All that mattered was that it was easy and Mr. C liked it. So once that was decided, he set to work sanding the block. Then I painted it. And I drew on all the Wii details, but I thought it looked too hand drawn and decided to paint over and start again. Then I got too impatient as it was drying and left finger prints. Then I sanded off the finger prints and painted again (this was all the day before the Derby...we are procrastinators, what can I say). The block wasn't drying fast enough and we wanted to get to work decorating and adding wheels so I thought I could heat the oven to low and maybe bake it dry. Well, do NOT try that. Ever. It just made the beautifully smooth paint bubble up all over and if I would have thought it through for more than two seconds, I would have realized that would happen, but I didn't so we were left with bubbly wood. Errrrrg. I threw it on top of the fridge and we did nothing with the car for the rest of the night. The next day came (Derby Day) and I got out the power sander and sanded those pesky bubbles for ages to get them out, basically going down to the wood again. And then I painted. Again. And I eversocarefully applied that spray paint. And I waited and waited for it to dry. Finally, by the afternoon it was ready. I took my hubby's advice and used white craft foam for the buttons, instead of drawing them on. I was so nervous I would screw it up again at this point. I was seriously shaking and had heart palpitations. Shaky fingers don't lend themselves to perfect craft foam circles or nice handwritten text. So I talked myself through it. "What in the WORLD is your problem?! It's a car, well it's actually a block of wood, and nothing serious will happen to you (or Mr. C) if you mess it up a little and your lines aren't perfectly straight and your circles aren't perfectly round. Just take a deep breath and calm the heck down." So I finally finished, added the vinyl letters my friend made for me and handed it to my husband to get the wheels attached. Which is tricky as well. And then there was adding the weights and aligning the wheels and adding the graphite. Sheesh. What a project. Mr. C was ecstatic. And I was just left thinking about the fact that my hubby and I did 95% of the work. Oh well. Mr. C did sand it and he helped a tiny bit with the wheels. But it is hard, delicate work, and so he watched. In the end, it did well, winning two races (even with its non existent aerodynamics). Mr. C got an award for Most Imaginative Car and he was happy. And it was finally all over without anymore catastrophes, so I was happy, except for the fact that graphite makes a beautiful white car all graphite-y and it's annoying. It looks gorgeous, Erika! There are times when having a compulsively creative personality is a health-hazard, I think. Life is probably a lot easier for everyone who doesn't care. But still, how cool is that car?!? I'm so proud of you and your nice craft project, I would have totally given you a blue ribbon for it...I was wondering how you did the circles and got the "Wii" symbol so perfect, thanks for explaining...p.s. maybe a hair dryer next time? Oh honey, my brother has 4 boys, and he would totally agree with your approach, power sanders and all. "When they are this age, it is very precarious thing how you handle it. 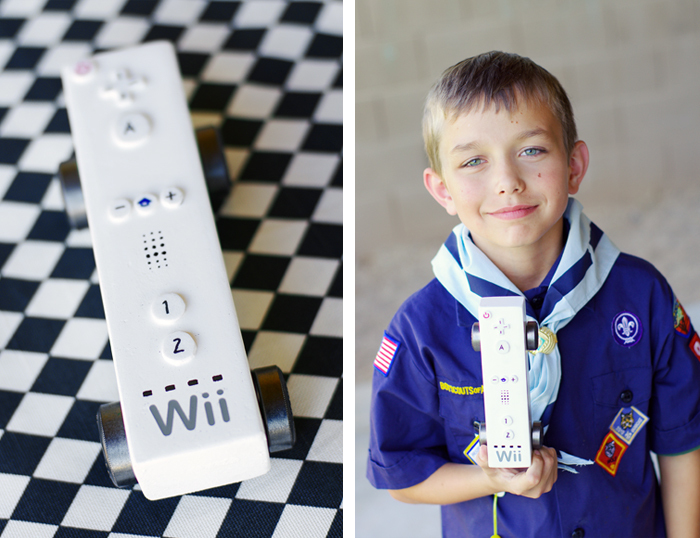 If you louse it up at the pinewood derby, and your kid is standing there with a piece of hud crap-o-la car while Superdad and his son are walking away with the prize, your cape comes off. You are no longer Superdad. And never will be again... until they are, like, 35." Benjamin is only 6, but I have already been instructed: bake the car, wedge design, wheels and weights far in the back, get a food weight scale to put it at EXACTLY 5 oz. Paint in layers, graphite on wheels, not nails. I think there is more, but... its in a tome somewhere... I will be supermom!